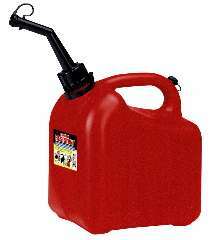 Gasoline Containers have child-resistant closures. Models CP-10, CP-20, CP-500, and CP-60 have 1, 2, 5, and 6 gallon capacities, respectively. Containers have passed Child Resistant Closure testing protocol established by US Consumer Product Safety Commission. Spill-resistant containers are self-closing and self venting, and also include child-resistant feature. Ergonomic handle provides secure, comfortable grip even while wearing gloves. Aerosol Cans offer necked-in or straight-sided neck profile. Aerosol Lubricants feature 2-way integrated actuator.